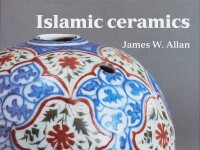 A select catalogue of the Ashmolean's collection of ceramics from the Islamic world from the 9th to 18th century, by James Allen (published Oxford, 1991). Although documented European interest in Iznik ceramics is so scarce (nos. 46-47 [EAX.3268 & WA1888.CDEF.C324]), there was evidently a lively interchange of objects and, to a lesser extent, ideas, through regular Mediterranean trade. The Ottoman court also showed a continuing interest in Italian art. Thus, for example, from 1478-81 Costanzo da Ferrara worked in Istanbul as a medallist, and Michelangelo, even though he did not take up the invitations, was twice invited to Istanbul, once in 1506 to build a bridge over the Golden Horn and again in 1519 to paint for Sultan Selim. It is no surprise therefore to find the occasional influence of Italy in the products of Iznik. 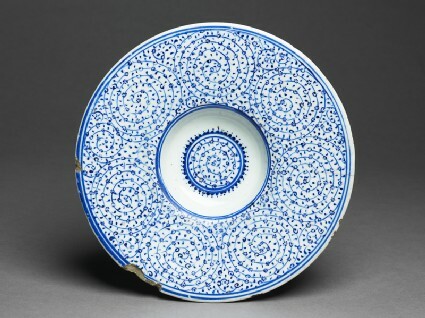 A dish in the Victoria and Albert Museum has a medallion portrait of a Turkish youth in the centre, following the fashion in Italian maiolica, and this Ashmolean piece, with its wide flat rim and small bowl-shaped recess is a ‘tondino’ dish, characteristic of the taste of Italy in the early 16th century. The design on the other hand is purely Ottoman. Objects in this style have traditionally been known as ‘Golden Horn’ ware, but the design has recently been more accurately named as the ‘Tugrakes spiral style.’ For it is derived from the illuminated spiral scroll used on royal documents as a background design for the Sultan’s tughra, or imperial monogram. In particular, it relates very closely to that on a document dating from the reign of Sultan Suleyman the Magnificent, c. 1523-36. Here, therefore, we have a ceramic design which directly reflects the taste of the imperial court. N. Atasoy and J. Raby, Iznik. The Pottery of Ottoman Turkey (London 1989) pp. 108-113. This dish is a good example of the cross-cultural exchange that occurred between Europe and the Islamic world during the early modern period. Dishes in this shape - known as tondino have a broad, flat rim and small, bowl-shaped center, and were a popular form in 16th century Italian maiolica production. The decorative style on this dish, however, is typical of Ottoman ornamentation from the first half of the 16th century. Characterized by leafy spirals painted in cobalt blue, this style is known as ‘Golden Horn’, a reference to numerous fragments with similar patterns found on the southern shore of the Golden Horn, the inlet dividing Istanbul. Presented by C. D. E. Fortnum, 1888.